Add assorted sizes and colors of glass beads – contrasting or complimentary. Curl the ends around the end of a thin paint brush to get smooth, decorative ends to complete the look. I think they look nice with or without flowers. What an inspired idea! 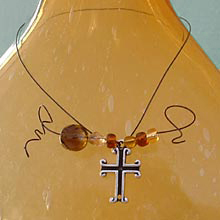 I love colored (or even clear) bottles of all shapes and sizes and have a collection of crosses and medals which just sit in a lonely jewelry box to be brought out and dusted off for a wear once in a while when I change necklaces. I am getting on this one right away. 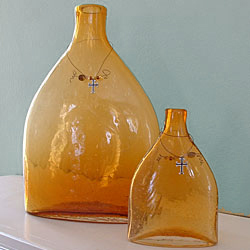 The amber vases in the photos are grand. I adore the color. Good job, I love your post today.